This tour runs all year round. The night sky changes throughout the seasons and although it is a bit colder, winter time is one of the best times of the year to see the Milky Way in the Southern Hemisphere. The highlight of this tour is "Dinner Under the Stars" in the spectacular Pinnacles Desert. The night sky above the Pinnacles is stunning and one can get a close up look at the stars and planets through our telescope. Attach your smart phone to the telescope to try your hand at astrophotography. We also visit the Swan Valley to sample wine, chocolate and honey and go sand surfing in Lancelin as part of this tour. We specialise in small group tours using our modern 12-seater Renault bus so please book early to avoid missing out. Gombok Gallery Sculpture Park which is the largest privately owned art gallery in Western Australia. At the Margaret River Chocolate Factory you can sample free chocolates and buy some of their famous produce. The next stop is the House of Honey where you can sample their wide range of locally made honey. Experience the thrill of sand boarding at one of Australia’s premier sand boarding destinations, the Lancelin Sand Dunes. You will be impressed by the pure white sand and be awestruck by the giant sand dunes that can be up to three stories high. We have our own custom made sand boards for you to use . We stop here during wildflower season to do a short walk along the wildflower walking trail. The Pinnacles desert, a unique Australian landscape. We get there late in the afternoon which is one of the best times to photograph the Pinnacles where the shadows of the Pinnacles create remarkable patterns and shapes that ripple over the desert sands. There will be plenty of time to walk through the Pinnacles landscape and we will have a BBQ picnic dinner on the observation deck under the stars. After dinner, it’s time to slow down and unwind under the stars of the stunning outback night sky. We have a telescope and spotting scopes which will allow you to get a close up view of the stars and some of the planets. You can even attach your smart phone to the telescope to take some stunning photos of the night sky. 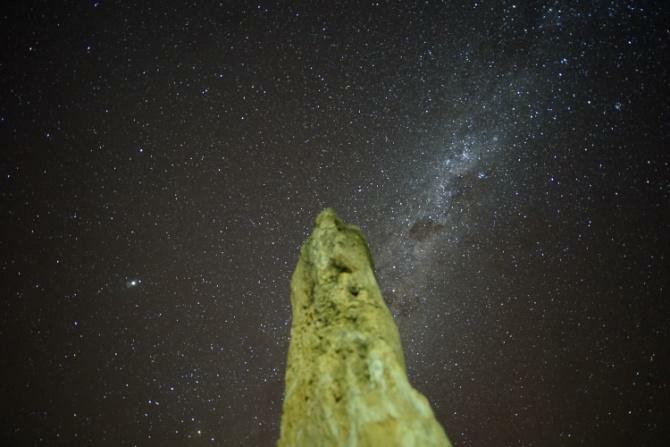 Using a laser pointer your tour guide will point out items of interest in the sky and you can hear stories of the Aboriginal Dream Time Look out for the Milky Way and see if you can spot the giant scorpion, the kangaroo or the emu in the sky. You may also see planets such as Venus, Saturn and Jupiter depending on the time of year. We provide dinner under the stars where you get to sample fresh produce from Margaret River and the Swan Valley including our famous Western Australian wines. Please let us know if you have any specific dietary requirements. Your tour guide has an extensive knowledge of the local wildlife and vegetation as well as some of the history of the areas you will see. He can show you some of the plants traditionally used by the local Aborigines for food and medicine as well as tell you about some of the many shipwrecks off the Turquoise Coast from the early European Explorers.